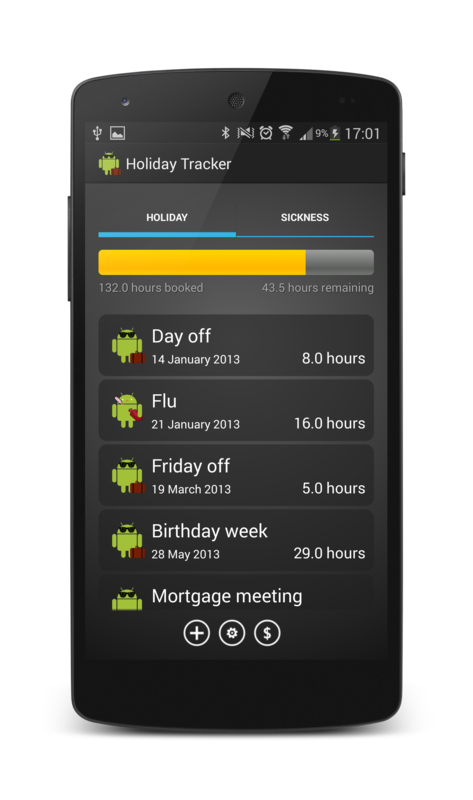 Holiday Tracker for Android helps you to keep track of, and plan how to use, your valuable holiday/vacation entitlement from your workplace. Tell Holiday Tracker how much time off your are entitled to (measured in either days or hours), then log all the time off you have taken, or are going to take, by adding holiday bookings. Holiday Tracker will always clearly indicate how much time off you still have available. Also keep track of time you have had off work due to sickness. Getting to the end of the year and have holiday to spare? If you can sell your remaining holiday back to your workplace, Holiday Tracker can give you a valuation. Holiday Tracker is also available for Windows Phone.